Mt Elie de Beaumont is the northern-most 3000-metre peak in the Southern Alps Ka Tiritiri O Te Moana. Head up the glacier (which later in the season can be cut off by crevasses) usually keeping close under Mt Walter. Then ascend slopes onto the col between Mts Walter and Elie de Beaumont. Follow an easy snow ridge up to the summit (but watch out for hard ice just above the col). This is the usual descent route. Routes can be pushed directly up the Anna Glacier to the summit in good snow conditions. 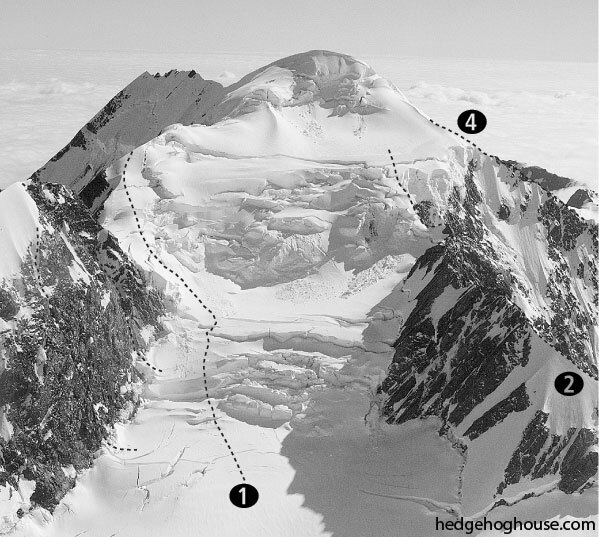 If the Anna Glacier is badly crevassed and the col between Mts Walter and Elie de Beaumont is cut off, traverse from Divers Col over Mt Walter to Elie de Beaumont. From Lendenfeld Saddle climb the sharp and undulating ridge onto the upper Anna Plateau (there may be an unpleasant ice cliff here) and easily onto the summit. From the Burton Glacier gain the ridge via a couloir south of Roderick Peak. 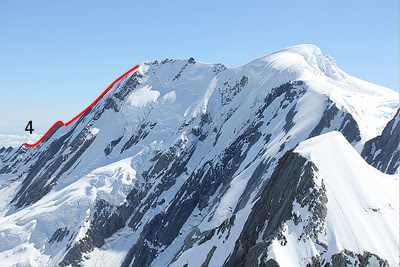 Then follow the pinnacled ridge (the lower part of the ridge may be avoided by using the névé of the Burton Glacier) up over a prominent step, along a level section, and up 190m of mixed ground to the Anna Plateau under the summit of Mt Elie de Beaumont. Ed Cotter, Ed Hillary, George Lowe, Earle Riddiford, January 1951. Ben Ellis, Jack Grinsted, Josh Mitchell, August 2017. From the upper névé of the Burton Glacier (reached via the lower part of the Maximilian Ridge, ascend left onto the crest of the rib. Mixed climbing leads onto a snow arête and snow slopes leading to the summit. From the Whymper Glacier, ascend the prominent spur leading onto the upper part of the Maximilian Range. The spur becomes steeper and more difficult towards the top, and the rock is not particularly good. The first ascent was done in deep soft snow. 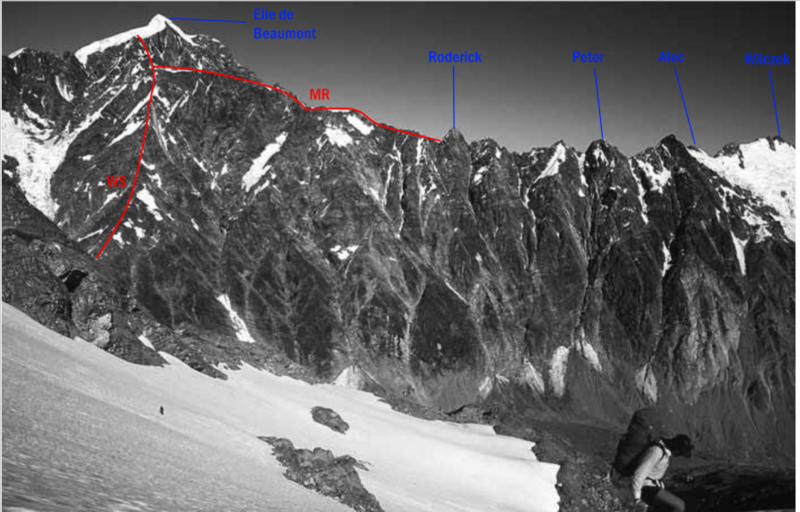 Experienced mountaineers may attempt ascents of other peaks in the region including Elie de Beaumont (3109m). From the huts, traverse underneath the west shoulder of Hochstetter Dome and turn north into the upper Anna Glacier. There are often large crevasses on the Anna Glacier, and at times it may be impassable. It is best to scope out the glacier conditions from the summit of Hochstetter Dome the day before, to get some idea of the conditions. Beware also of possible ice avalanches from Mt Walter. Most skiers leave their skis on the south west shoulder of Elie, but under ideal conditions it is possible to ski off the summit. Advanced ski terrain. 6-10 hours return.